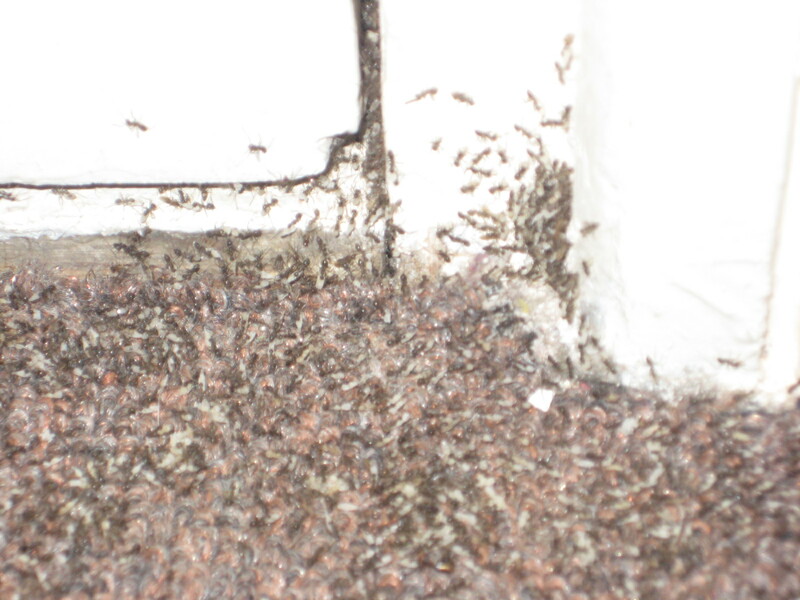 But really, there was a literal river of ants flowing from the balcony door, around the corner, and into a crack in the wall. I’m not great with numbers, but there must have been at least one or two, maybe millions, or something like thousands of ants endlessly streaming into the wall, carrying an unknown substance to their queen for her to feast on. Powerless to stop the flood, we left the apartment and discovered upon our return that they had vanished, only one or two unpopular ones left behind. As we commented on how bizarre the experience was, I found a tiny note in the corner of the room near the ants’ escape crack. It was typed out very clearly and left little to the imagination, except for picturing the tiny ant computer. Here is the note, as it was written but slightly larger and edited for profanity. I assume by now you’ve noticed we have no regard whatsoever for your existence. It matters very little to us the arbitrary barriers you have placed on our earth, or the packaging in which you wrap our food. You cannot keep us out. We are tiny and there are millions of us. You are large, pasty, gangly, and one. You can’t even crawl up the sides of tile wall or build tunnels into the earth. Did you really think your two opposable thumbs would be a match for us? The thought is laughable. Between us, we have billions of limbs. In one hour, we could make a statue of President Obama the height of the Empire State building out of our severed limbs and then dismantle it. You could write three emails. Do you know how many possible entrances there are in your room alone? What about just the area surrounding your bed? Thousands. There are thousands of ways for us to invade in the middle of the night, swarming across your face, tickling your nostrils until you wake up and begin screaming. As you thrash about clumsily you might take some of us, but you can’t actually believe this will affect anything. You might be bigger than us, but our combined weight is a number your puny brain is incapable of comprehending both because of its size and because it is rendered in kilos, so I’m not even going to waste my ant breathe. The trick we performed earlier was meant to send a message: you are weak and powerless. Your degrees mean nothing to us. Bam! We’re there. We’re a river. We’re a thick, writhing mass that makes the carpet look alive. Boom! We’re gone. You have no idea what happened. You’re in the dark. You’re drooling, clueless, as you will remain. We are in the walls. We are in the ceiling. We have this entire place surrounded and if we ever have the cause to investigate a sugar or pie situation, there will be no mercy. We will throng and our queen will feast. Bring chemicals if you must, just know that where one falls three rise to take his place, each a little crazier than the last. I think she was actually a co-signer on the note. They must keep copies of it lying around just in case a human gets uppity.